The PPSh-41 (pistolet-pulemyot Shpagina; Russian: Пистолет-пулемёт Шпагина; "Shpagin machine pistol"); is a Soviet submachine gun designed by Georgi Shpagin as a cheap, reliable, and simplified alternative to the PPD-40. Common nicknames are "pe-pe-sha" from its three-letter prefix and "papasha" (Russian: папаша), meaning "daddy". The PPSh saw extensive combat use during World War II and the Korean War. It was one of the major infantry weapons of the Soviet Armed Forces during World War II. Around six million PPSh-41s were manufactured. 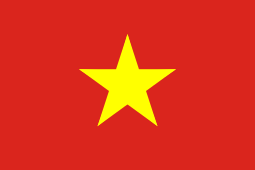 In the form of the Chinese Type 50 (a licensed copy), it was still being used by Vietnamese Viet Cong as late as 1970. According to the 2002 edition of the Encyclopedia of Weapons of World War II the PPSh was still in use with irregular military forces. The impetus for the development of the PPSh came partly from the Winter War against Finland, where the Finnish Army employed the Suomi KP/-31 submachine gun as a highly effective tool for close-quarter fighting in forests and built-up urban areas. A submachine gun, the PPD-40, was subsequently rushed into mass production in 1940, but it was expensive to manufacture, both in terms of materials and labor, because it used numerous milled metal parts, particularly its receiver. Shpagin's main idea for cost reduction was to use metal stamping for the production of most parts; that concept was revolutionary in the Soviet Union at the time. Shpagin created a prototype PPSh in September 1940, which also featured a simple gas compensator designed to prevent the muzzle from rising during bursts; this improved shot grouping by about 70% relative to the PPD. The new weapon was produced in a network of factories in Moscow, with high-level local party members made directly responsible for meeting production targets. A few hundred weapons were produced in November 1941 and another 155,000 were made during the next five months. By spring 1942, the PPSh factories were producing roughly 3,000 units a day. 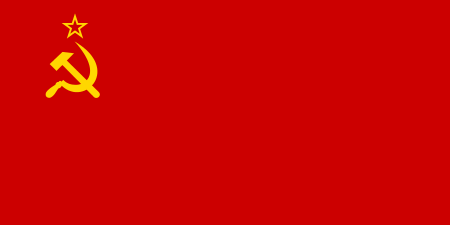 Soviet production figures for 1942 indicate that almost 1.5 million units were produced. The PPSh-41 is a classic example of a design adapted for mass production (other examples of such wartime design are the M3 submachine gun, MP40, PPS, and the Sten). Its parts (excluding the barrel) could be produced by a relatively unskilled workforce with simple equipment available in an auto repair garage or tin shop, freeing more skilled workers for other tasks. The PPSh-41 uses 87 components compared to 95 for the PPD-40 and the PPSh could be manufactured with an estimated 5.6 machining hours (later revised to 7.3 hours) compared with 13.7 hours for the PPD. Barrel production was often simplified by using barrels for the 7.62mm M1891 Mosin–Nagant rifle: the rifle barrel was cut in half and two PPSh barrels were made from it after machining the chamber for the 7.62mm Soviet submachine gun cartridge. After the German Army captured large numbers of the PPSh-41 during World War II, a program was instituted to convert the weapon to the standard German submachine gun cartridge – 9×19mm Parabellum. The Wehrmacht officially adopted the converted PPSh-41 as the "MP41(r)"; unconverted PPSh-41s were designated "MP717(r)" and supplied with 7.63×25mm Mauser ammunition (which is dimensionally identical to 7.62×25mm, but slightly less powerful). German-language manuals for the use of captured PPShs were printed and distributed in the Wehrmacht. As standard each PPSh-41 came with two factory fitted drum magazines that were matched to the weapon with marked serial numbers. 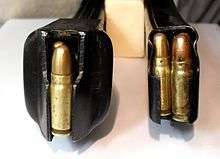 If drum magazines were mixed and used with different serial numbered PPSh-41, a loose fitting could result in poor retention and failure to feed. Drum magazines were superseded by a simpler PPS-42 box-type magazine holding 35 rounds, although an improved drum magazine made from 1 mm thick steel was also introduced in 1944. The PPS, an even simpler submachine gun, was later introduced in Soviet service in 1943, although it did not replace the PPSh-41 during the war. The Soviet Union also experimented with the PPSh-41 in a close air support anti-personnel role, mounting dozens of the submachine guns in forward fuselage racks on the Tu-2sh variant of the Tupolev Tu-2 bomber. More than five million PPSh submachine guns were produced by the end of the war. The Soviets would often equip platoons and sometimes entire companies with the weapon, giving them excellent short-range firepower. 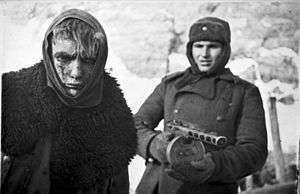 Thousands more were dropped behind enemy lines in order to equip Soviet partisans to disrupt German supply lines and communications. After the Second World War, the PPSh was supplied in large quantities to Soviet client states and Communist guerrilla forces. The Korean People's Army (KPA) and the Chinese People's Volunteer Army (PVA) fighting in Korea received massive numbers of the PPSh-41, in addition to the North Korean Type 49 and the Chinese Type 50, which were licensed copies of the PPSh-41 with small mechanical revisions. The weapon was widely used during the Korean War. Though relatively inaccurate, the Chinese PPSh has a high rate of fire and was well-suited to the close-range firefights that typically occurred in that conflict, especially at night. United Nations forces in defensive outposts or on patrol often had trouble returning a sufficient volume of fire when attacked by companies of infantry armed with the PPSh. Some U.S. infantry officers ranked the PPSh as the best combat weapon of the war: while lacking the accuracy of the U.S. M1 Garand and M1 carbine, it provided more firepower at short distances. As infantry Captain (later General) Hal Moore, stated: "on full automatic it sprayed a lot of bullets and most of the killing in Korea was done at very close ranges and it was done quickly – a matter of who responded faster. In situations like that it outclassed and outgunned what we had. A close-in patrol fight was over very quickly and usually we lost because of it." Other U.S. servicemen, however, felt that their M2 carbines were superior to the PPSh-41 at the typical engagement range of 100–150 meters. The PPSh-41 fires the standard Soviet pistol and submachine gun cartridge, the 7.62×25mm (Tokarev). Weighing approximately 12 pounds (5.45 kg) with a loaded 71-round drum and 9.5 pounds (4.32 kg) with a loaded 35-round box magazine, the PPSh is capable of a rate of about 1000 rounds per minute, a very high rate of fire in comparison to most other military submachine guns of World War II. It is a durable, low-maintenance weapon made of low-cost, easily obtained components, primarily stamped sheet metal and wood. The final production PPShs have top ejection and an L type rear sight that can be adjusted for ranges of 100 and 200 meters. A crude compensator is built into the barrel jacket, intended to reduce muzzle climb during automatic fire. The compensator was moderately successful in this respect, but it greatly increased the muzzle flash and report of the weapon. The PPSh also has a hinged receiver to facilitate field-stripping and cleaning the weapon. A chrome-lined bore enables the PPSh to withstand both corrosive ammunition and long intervals between cleaning. No forward grip or forearm was provided, and the operator generally has to grasp the weapon behind the drum magazine with the supporting hand, or else hold the lower edge of the drum magazine. Though 35-round curved box magazines were available from 1942, the average Soviet infantryman in World War II carried the PPSh with the original 71-round drum magazine. The PPSh drum magazine holds 71 rounds. In practice, misfeeding is likely to occur with more than about 65. In addition to feed issues, the drum magazine is slower and more complicated to load with ammunition than the later 35-round box magazine that increasingly supplemented the drum after 1942. While holding fewer rounds, the box magazine does have the advantage of providing a superior hold for the supporting hand. Although the PPSh is equipped with a sliding bolt safety, the weapon's open-bolt design still presents a risk of accidental discharge if the gun is dropped on a hard surface. A German soldier with the PPSh-41 amid the ruins of Stalingrad, 1942. 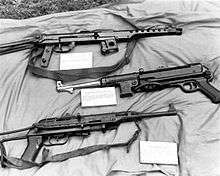 A collection of submachine guns captured from NVA forces. From top to bottom: PPS-43, MP 40, K-50M. 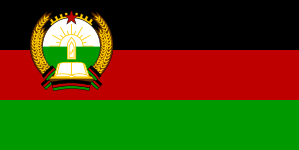 Afghanistan - Formerly in service with the Afghan Army in the 1980s. Also used by various self-defense groups. 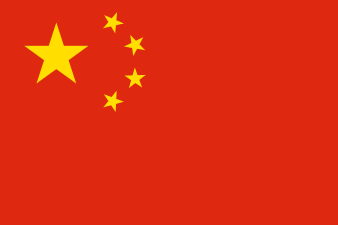 China: Made unlicensed copies under the designation "Type 50". 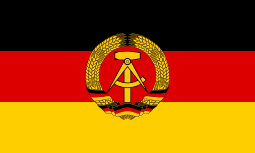 East Germany: Used by the East German Grenztruppen and became an unofficial symbol of the force. Designated "MPi41" in DDR service the PPSh-41 was gradually replaced by the AK-47 beginning in 1960. Hungary: Captured and reissued PPSh-41s in the early 1940s. Produced a local version in the early 1950s called the "7.62mm Géppisztoly 48.Minta", or simply "48m". 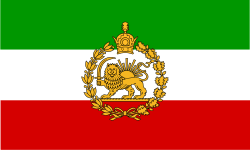 Iran: Produced a local version in the 1940s with a tangent rear sight. Nazi Germany: Used captured guns, and also converted some to 9×19mm Luger under the designation "MP41r". North Korea: Made licensed copies under the designation "Type 49". Poland: Produced a local version, identical to late production Soviet design. Made under license as the "7.62 mm pm wz.41" by Łucznik Arms Factory. It was used by the First Polish Army. Romania: Captured and reissued PPSh-41 submachine guns during 1941-1944. Made licensed copies during the 1950s at Cugir Arms Plant under the designation "PM PPȘ Md. 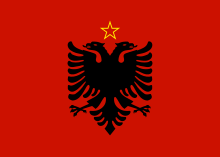 1952". 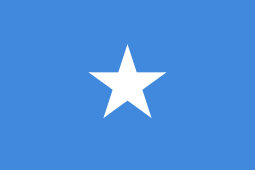 Somali Democratic Republic: 1970-80s by the Siad Barre military dictatorship. Soviet Union: In service with the Soviet Army in 1942. 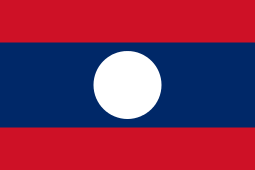 North Vietnam: The Vietcong used the K-50M license-built copy during the Vietnam War. Yugoslavia: Locally produced a variant known as the M49 Submachine gun. Type 50: A Chinese-made version of the PPSh-41. Unlike its Soviet counterpart, it only accepts column-type box magazines. Type 49: A North Korean made version of the PPSh-41. This model only accepts drum-based magazines. K-50M: A Vietnamese-made submachine gun based on the Type 50s supplied by China during the Vietnam War. The chief difference is that the cooling sleeve of the K-50 was truncated to three inches (76 mm) and a foresight based on that of the French MAT-49 was attached to the front of the barrel. Modifications include the addition of a pistol grip, a steel wire-made stock and the shortened barrel. The changes resulted in a weight of 3.4 kg (7.5 lb), making K-50M lighter than the PPSh-41 by 500 g (1.1 lb). The weapon uses a 35-round stick magazine, but the 71-round drum magazine can be used if the stock is fully retracted. MP41(r): A captured PPSh-41 converted to 9×19mm Parabellum caliber for use by German forces. M-49: A Yugoslavian produced variant of the PPSh-41 design, though it differs in several important ways. PPS-50: A semi-automatic manufactured by Pietta. A non-restricted firearm in .22LR ammunition. The box magazine holds 30 and the drum magazine holds 50. It is cosmetically similar to the PPSh-41, although the two share no other features. VPO-135: A semi-automatic version of the PPSh-41 from Russia. LTD PPSh-41: A semi-automatic-only clone of the PPSh-41. This variant with its fixed wooden stock is manufactured by Luxembourg Defence Technology for the civilian European sport shooting market. SKL-41: A semi-automatic version of the PPSh-41 which became available on the German market in 2008. 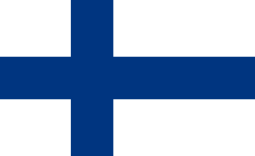 This version is converted to fire the 9×19mm Parabellum cartridge. Aside from replicas of its original magazines, it also accepts MP 40 magazines. 1 2 3 Bishop, Chris (1998), Guns in Combat, Chartwell Books, ISBN 0-7858-0844-2 . 1 2 Raeburn, Michael. We are everywhere: Narratives from Rhodesian guerillas. pp. 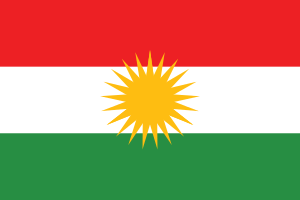 1–209. ↑ The Defense Of Bosnia. Studio "FLASH" Sarajevo. April 1999. Event occurs at 18:29. Retrieved 22 May 2015. ↑ Наставление по стрелковому делу. Пистолет-пулемёт обр. 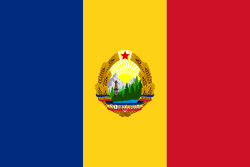 1941 г. [NSD-41. PPSh-41] (in Russian). Moscow: Voenizdat. 1941. ↑ Edwards, Paul M (2006). The Korean War. Westport, CT: Greenwood Press. p. 77. ISBN 0-313-33248-7. ↑ Bishop, Chris (2002). The Encyclopedia of Weapons of World War II (Illustrated ed.). Sterling Publishing Company, Inc. p. 261. ISBN 1-58663-762-2. 1 2 3 Болотин, Давид (1995). История советского стрелкового оружия и патронов (in Russian). Полигон. pp. 109–114. ISBN 5-85503-072-5. ↑ Болотин, Давид (1995). История советского стрелкового оружия и патронов (in Russian). Полигон. pp. 111 for the early estimate vs. PPD and p. 119 comparison with PPS. ISBN 5-85503-072-5. 1 2 "9 mm Conversion of the PPSh-41". Retrieved 2010-03-21. ↑ Bishop, Chris (2002). The encyclopedia of weapons of World War II. New York: MetroBooks. ISBN 9781586637620. Retrieved 19 October 2014. 1 2 3 Halberstam, David (2007). The Coldest Winter. Hyperion Press. p. 447. ISBN 978-1-4013-0052-4. ↑ Leroy Thompson (2011). The M1 Carbine. Osprey Publishing. p. 56. ISBN 978-1-84908-619-6. ↑ "Shpagin PPSh-41 submachine gun (USSR)". Retrieved 2010-03-21. 1 2 3 4 Jones, Richard D.; Ness, Leland S., eds. (January 27, 2009). Jane's Infantry Weapons 2009/2010 (35th ed.). Coulsdon: Jane's Information Group. ISBN 978-0-7106-2869-5. 1 2 Miller, David (2001). The Illustrated Directory of 20th Century Guns. Salamander Books Ltd. ISBN 1-84065-245-4. ↑ Rottman, Gordon (2008). The Berlin Wall and the Intra-German Border 1961-89. Oxford: Osprey Publishing. p. 44. ISBN 978 184603 1939. ↑ "Machine Pistols, Captured and Bought". Retrieved 2012-01-28. ↑ "9 mm version of PPD-40 and PPSh-41". Retrieved 2012-01-28. ↑ World Armies, 1983. Page 239. 1 2 Maj. Gen. J. I. Hardback. Owen (1976). Warsaw Pact infantry and its weapons: Manportable weapons and equipment in service with the regular and reserve forces of the Soviet Union, Bulgaria, Poland, Rumania, and of Yugoslavia. ↑ Thomas Ohlson. 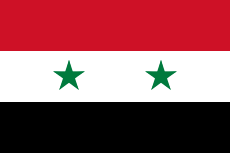 Arms Transfer Limitations and Third World Security. Oxford University Press. p. 103. ISBN 0-19-829124-8. 1 2 3 US Department of Defense, North Korea Country Handbook 1997, Appendix A: Equipment Recognition, PPSH 1943 SUBMACHINEGUN (TYPE-50 CHINA/MODEL-49 DPRK), p. A-79. ↑ Steven J. Zaloga, Richard Hook (1982). The Polish Army 1939-1945. Osprey Publishing. p. 39. ISBN 0-85045-417-4. ↑ "Radom Before the Kalashnikov". Łucznik Arms Factory. Archived from the original on 2013-12-08. Retrieved 2013-12-08. ↑ "About us". Fabricadearmecugir.ro. Cugir Arms Plant SA. Archived from the original on 2012-04-03. Retrieved 2013-12-08. ↑ Infanteria Română - 180 de ani (PDF). București: Editura Centrului-Tehnic Editorial al Armatei. 2010. p. 261. ISBN 978-606-524-071-1. ↑ Philip Peterson (2011). Standard Catalog of Military Firearms: The Collector's Price and Reference Guide. p. 479. ISBN 1-4402-1451-4. ↑ Rob Krott. Save the Last Bullet for Yourself: A Soldier of Fortune in the Balkans and Somalia. p. 175. ISBN 1-932033-95-5. ↑ "PPSh41 Sub Machine Gun". Retrieved 2009-01-17. 1 2 "Modern Firearms' K-50M Submachine Gun". Retrieved 2009-01-17. ↑ "VC Weapons". Retrieved 2009-01-17. Wikimedia Commons has media related to PPSh-41. Photographs of the markings present on different variations of PPSH-41 guns and their clones.